Bochra with some of her fellow Moroccan participants at the White House for a screening of We Will Rise. First Lady of the United States Michelle Obama invited 22 Moroccan girls and 22 Liberian girls to the White House for the premiere of the CNN documentary We Will Rise on October 11, the International Day of the Girl. 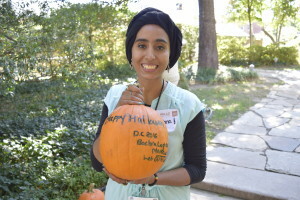 I was one of the Moroccan girls invited to Washington D.C. as part of First Lady Obama’s “Let Girls Learn” initiative. The White House visit was a follow-up to First Lady Obama’s visit to Liberia and Morocco in June 2016, during which we Moroccan girls participated in a roundtable discussion on the challenges young girls face in order to continue our schooling. Meryl Streep, Freida Pinto and CNN correspondent Isha Sesay also participated in the discussion. We Will Rise features these important conversations. For most of the girls, this trip was the first time we had ever flown on an airplane. When we visited the Air and Space Museum, it was fascinating to learn the mechanics of how we flew from Morocco to D.C. Another amazing place we visited was the newly opened National Museum of African American History and Culture, where we saw how African American history is recognized and the current issues that still face the community. We also had the chance to explore the entire city of Washington D.C., and see historical places such as the Washington Monument, the Lincoln Memorial and the Martin Luther King Jr. Memorial. This weeklong trip would not have been possible without the many people who supported us, especially the U.S. Embassy team who helped us during the process of getting our visas and accompanied us during our week in D.C., Royal Air Maroc for donating 15 seats on the plane for us girls, and Peace Corps Morocco for all their hard work on the ground working with girls in our communities. Many thanks as well to the U.S. Department of State for all their efforts with exchange programs, working along Meridian International. Bochra wishes everyone a Happy Halloween from Meridian! This is the work that we are committed to for the rest of our lives. I encourage you to help uplift the voices of the 62 million girls around the world who are just like us and join our movement. Go to letgirlslearn.gov to see how you can help. POST TAGS: Africa, Education, Exchange, Global Leaders, Global Leadership, Global Women's Issues, international education, Liberia, Morocco.